Attention Mystery Case Files fans! Join CGG as we review the entire Mystery Case Files game catalog — from first to last — in anticipation of its newest release slated for fall 2012. It's funny how ideas come at you out of the blue. Tracy and I were talking the other day about, what else, games and reviews. She mentioned that the Mystery Case Files series would be bringing out a new game this fall — their 11th if memory serves. "Pretty successful games series," I conceded. "Yeah," said Tracy, "but I wonder if anyone has reviewed every single one?" That little comment led us down another rabbit hole about what it would be like to move through every Mystery Case Files game, playing and reviewing to examine how the games evolved during the past seven years. It occurred to me that movie fans are always doing film retrospectives to analyze how, say, Woody Allen progressed as a director from Take the Money and Run to Midnight in Paris. Why would games and game fans be any different? Because game fans have favorite storylines, and series, we thought it would be fun to take a closer look at one game developer’s progression. So, we invite you to join us every week as we work our way through the Mystery Case Files, beginning with Huntsville and ending with their newest offering this fall. Feel free to share your likes and dislikes about the ones you’ve played and consider trying one or two that you missed along the way. 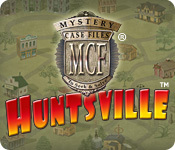 Therefore, without further ado, we bring you our first review of Mystery Case Files: Huntsville. As with many of the Mystery Case Files games, it’s only fair to judge Huntsville in the context of its time period, which, in this case, is late 2005. And, based on that understanding, I think Mystery Case Files: Huntsville acquits itself admirably. I’ll be honest that the name — Mystery Case Files: Huntsville — initially threw me for a loop. Huntsville? Alabama? That’s a hotbed of criminal activity, eh? Why not CSI: Fargo or Cheyenne Vice? After musing on it for a bit, it occurred to me that perhaps the Huntsville wasn’t a reference to that city in the great Southern state, but rather a play on the word "hunt," as in hunting for clues in "Huntsville." Guess, if that’s true, it makes a little more sense. The game itself offers 14 cases for you, as the investigator, to solve. Case scenarios are presented on a sheet of notebook-style paper. This presentation device reminded me a little of the Encyclopedia Brown or Two-minute Mysteries books I read as a kid. After you are briefed on the case scenario, you are transported to the town map where Hidden Object Area clue locations such as the fire station or pawn shop are highlighted. Through these Hidden Object Areas you collect clues, which, once you have a sufficient number, are fed into the Crime Computer. You are then provided with a final challenge in the form of a "switch the squares" puzzle to uncover the culprit and finish that level. In the beginning levels, you are only tasked with two or three map location Hidden Object Areas that feed into the final puzzle, but, as you progress in the game, more locations are added. Within each level, you are only allotted three hints, which struck me as incredibly stingy, especially when you consider the visuals lack a certain crispness, making things hard to spot. For example, I stared endlessly at the screen before giving up and using one of my precious hints to find a near-invisible fuzzy black tie on an equally fuzzy black chair. And, of course, as more Hidden Object Areas are added on each level, the scant hints become a more serious issue. Because of the parsimonious parceling out of hints, I found myself hoarding them with the zeal of Ebenezer Scrooge on rent payment day. Because you don’t have to solve every Hidden Object Area before moving to the crime computer, I employed this little tactic to husband my hints wisely. First, I went to each map location and immediately clicked the items most readily apparent, even if it was only a few. Then, I returned to each location a second time beginning with the ones with the fewest remaining items. I found my eyes adjusted somewhat on second and third viewings. In this way, you proceed toward the total number of clues required in the most economical way possible, only using hints when you absolutely must. As mentioned, when sufficient clues are amassed, you are presented with a puzzle of jumbled squares. Click on two to swap their positions. When placed in the proper position, the squares get grayed out and lock in place. The puzzle picture essentially is one of the Hidden Object Areas, however, now the culprit of the crime is represented in the scene, showing that you nabbed ‘em. It can be a little difficult to reassemble the scene, so use the thumbnail (sans culprit) to put the major sections in place. Sometimes it helps to get the culprit in the right spot and then build out around him or her. The game makes no use of video and the music is largely a minor distraction. Considering its vintage, Mystery Case Files: Huntsville is an enjoyable achievement. It may not have enough happening to satisfy modern gamers spoiled by voice acting and video. But it’s a great beginner game for newbies and certainly straightforward and tame enough for kids.